Grant Gershon and the Los Angeles Master Chorale closed out the 49th season in a sentimental mood with an inspired program of “American Songs and Spirituals” in Walt Disney Concert Hall on June 2. By any reckoning, this season was great for the Master Chorale, and on this eve of the 50th year for the organization, Gershon pulled out the best of their talents, featuring an indigenous repertoire that nicely portrayed the depth and resilience of the American psyche. Samuel Barber’s lyrical Sure on This Shining Night for mixed chorus and piano opened the celebration. Based on text from James Agee’s Permit Me Voyage, the singers, accompanied by Lisa Edwards, previewed the tone for the night with the line “all is healed, all is health.” The flowing sound was beautiful, and it recalibrated us to a comfortable mood to start the journey ahead. Songs of Smaller Creatures by Abbie Betinis was a beautiful a cappella “word-painting” for mixed chorus. Soprano Risa Larson was outstanding. Onomatopoeia abounded in the bees song; add some vocal bends and trills, and the illusory movement became really convincing. The tempo slowed for a noiseless patient spider, excerpted from Walt Whitman’s Leaves of Grass. Gershon even worked the weaving theme into his gestures as the singers wove eight parts into a beautiful web of sound. The blend of the intricate counterpoint netted my attention with an inescapable allure. A butterfly came alive with her treatment of Charles Swinburne’s envoi: collections of repeated nonsense syllables. The singers are fantastic at this sort of device, and in the sublime acoustic of Walt Disney Concert Hall, the resonance and reverberation were perfect. The result was a beautiful, affective abstract language. Any true American music review would be incomplete without something from Charles Ives. Gershon chose General William Booth Enters Into Heaven. Loaded with Ivesian character, its harmony and rhythm bounded ahead, bubbling with the zeitgeist of its unique American transcendentalist roots. The voices were dramatic over dense chordal clusters that trod along in an irregular syncopated march. The singers brought Ives’ camp town climax alive as Jesus came “from out the courthouse door.” Gershon was animated in his abrupt tempo changes, and Edwards’ bumpy ending was delightful. Classic Ives; well done. Shawn Kirchner, currently the Swan Family Composer in Residence, premiered his Plath Songs, a cycle taken from American poet Sylvia Plath. Kirchner accompanied on piano, and percussionist Theresa Dimond added a unique dimension as she rotated on vibraphone, chimes, triangle, snare drum and bass drum. The singers convincingly portrayed the evocative subject; the darkness of the poetry was buoyed with a counterbalance of hope. Mirrors had the men and women singing to each other as if through an inverting lens. The polytonal personality of Lady Lazarus was intensely dramatic, and a strident, pounding bass drum made an impactful statement. The hollowness of the quartile harmonies was eerie in Blackberrying, emblematic of Plath and curiously effective. Kirchner made an inspired choice for his source materials, and his interpretation and scoring were sensitive and evocative of the complexity of Plath’s art. Bravo to Kirchner — certainly a new standard for American choral music! The second half of the program opened with Tarantella, Elliott Carter’s first published work, originally the finale for a Harvard Glee Club production of Mostellaria by Plautus. The score for four-hands on the piano and four-part male ensemble was strongly influenced by Stravinsky with elaborate layering of variations on up-tempo folk motifs. Associate Conductor Leslie Leighton took direction of Barber’s Agnus Dei. Based on his Adagio for Strings, this variation was sung a cappella. The Chorale added a unique dimension to the theme — a prosody of lament, of peace. Leighton is an expressive conductor, and the singers responded with finely nuanced dynamics and phrasings. Soprano Karen Hogle-Brown was stellar. 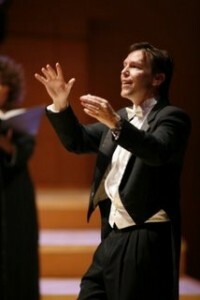 Eric Whitacre’s Three Songs of Faith were based on poems by e.e. cummings. Soprano Claire Fedoruk added a unique quality, and the singers artfully found the ethereal harmonies. There was an organic lushness to i will wade out in which Whitacre distilled cummings’ poem down to only eight words — hope, faith, life, love, dream, joy, truth, soul — spun around unique harmonies. In the third song, i thank you God for most this amazing day, the sonorous blend produced a beautiful shimmering effect. Gershon selected arrangements by legendary scholar/composers of American spirituals to end the evening. He seemed to literally perk up for these songs, and that feeling was transmitted throughout the hall. This music was phenomenally well suited to the Master Chorale, and the result was deeply moving. The sorrowful sound of the spirituals was laced with a seditious quality that came through clearly, and the resolve of the theme was expressed by a surprising precision from the technical prowess of the ensemble. William Levi Dawson’s rolling harmonies and antiphony in Aint’a That Good News gave rise to a rousing applause. André Thomas’ Keep Your Lamps! featured a hand-drum (conga) accompaniment that worked exceptionally well in context. Hold On! arranged by Jester Hairston was ambiguously spiritual and political as it climbed in a magnificent crescendo to its ending climax. The program ended on a dramatic high with The Battle of Jericho by Moses Hogan. The singers were animated and their voices virtuosic. The encore was one of the group’s finest pieces — Aaron Copland’s moving Shenandoah (Across the Wide Missouri). With eyes welled, the night gently vanished into a distant pianissimo, leaving us to contemplate a lingering peacefulness in our farewells. Congratulations to the Los Angeles Master Chorale for an impressive 49 years, and bravo on a joyful ending to a great season!